August 25, 2012 • Business and Industry, Canton, Expansion and Reform, Hartford, Invention and Technology, Who Knew? …that Elisha Root invented die casting that revolutionized the mechanization of factory operations. Elisha Root was 24 years old when he accepted a position from Samuel W. Collins at the Collins Company in Canton. As the 19th century’s largest axe manufacturing company, Collins’ goods were world famous. While in the company’s employ, Root invented the important industrial technique of die casting: the process of making an object by pouring molten metal into a die, or mold, and allowing it to harden. In 1849 Samuel Colt hired Root and brought him to Hartford to supervise the creation of a new factory and set up its machinery. Colt encouraged Root to mechanize factory operations. He designed advanced drop hammers, boring machines, gauges, and fixtures that standardized production and made the Colt revolver the first handgun in the world with fully interchangeable parts. 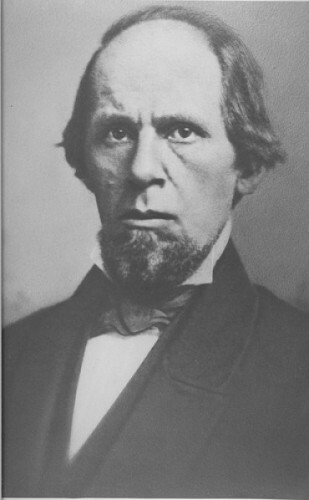 Root served as company president after Colt’s death in 1862, until his own in 1865. The Colt Model 1855, also known as the Root Revolver, was named after him and produced in two models between 1855 and 1870.